« The Ben Factor. One man drives a market. The world pretends it is “free”. CDM stands for Clean Development Mechanism, another pointless bureaucratic label that tells you nothing. Essentially it lets Western nations assuage their guilt by sending money to China to pay for dirty factories to be shut down. People in China promise that they wouldn’t have done it without the funding. People in the West nod solemnly and write them another cheque. No free market in the world operates this way and for obvious reasons. “Fearing low returns could force investors to abandon the scheme, the United Nations earlier this year commissioned a study into how much it would cost to buy up the credit surplus and keep the market functioning while nations have a second go at thrashing out a new global climate deal to succeed the Kyoto Protocol. The study, published Tuesday by Vivid Economics, revealed that without fresh demand, 4.7 billion credits would need to be taken out of the system by 2020, potentially costing 11.7 billion euros ($15b USD) to lift prices to just 2.50 euros. Since January, just 72 schemes have been registered, down 94 percent from more than 1,100 in the first five months of 2012, the U.N.’s data agency UNEP Risoe said last week. The Clean Development Mechanism could be called the China Development Mechanism since China has hosted half the schemes. Then again, the scheme has been beset with unintended consequences, and fraud, so Corruption Development could be the label of choice. In one spectacular example, at least two Chinese plants were switched on and off especially to qualify for credits — the plants made HFC-22, which is a greenhouse gas and worse, produces the Godfather of Greenhouse gases, HFC-23, as a byproduct. It’s 11,700 times more potent than CO2, so the byproduct became more profitable than the original product. Or rather the absence of the byproduct, became the product, if you know what I mean. (My post back here explains it). In the end, these plants made more greenhouse gases than they would have had the CDM fake market not existed. An EU vote will take place on July 3 to decide whether to support a weakened form of rescue of the carbon markets. 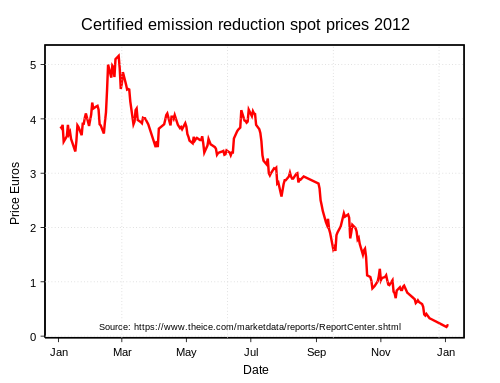 NZ carbon permits are stuck at record lows of $1.80. h/t to Pat and to Scott the trader. I’ve been in business all of my adult life. I cannot understand why these people do not get it! Someone please translate the rationale these people are using to justify their schemes? From my perspective, the word fool doesn’t do justice. In fact new words need to be invented that properly capture the insanity. In Berlin, Obame said “global warming climate change is the global threat of our time.” No. The hockey stick has been shown to be false, fabricated by a leftist activist “scientist” (Michael Mann). In the hockey stick graph Mann manipulated the data to eliminate the Medieval Warm Period (warmer than today! ), he eliminated the Little Ice Age (which we have been recovering from), and Mann grossly exaggerated the mild / barely noticeable warming of the 20th century. With the hockey stick debunked that means there’s nothing unusual about current temperatures, so the climate is not broken, the climate is fine!! We’ve had many ups and downs in temperature. But you see the slopes of temp change look identical in recent (high CO2) and past times (low CO2). CO2 has done… nothing. This doesn’t fit the supposed “established physics” on CO2. Back to the drawing board on CO2. Telling fables is what they are good at, now the New Republic is having second thoughts, reported here by the hockey schtick blog http://pindanpost.com/2013/06/21/crying-wolf/ and of course Obama made his comments from the capital of ‘Fables’. If they offer $15 billion I am sure that someone will put forward a scheme that wants the money. Although I can’t help feeling that spending that money in Asia and Africa to develop reliable electricity generation, e.g. hydro and coal fired, would be of the greatest benefit to the greatest number. ..the greatest benefit to the greatest number. To the Greens, that is the ultimate curse. Speaking of signposts, I could have sworn those world odometers such as http://www.worldometers.info/ used to show a temperature reading at 15 point something with the 6th (or higher) decimal place slowly increasing before your eyes. However, it’s not there any more! If anyone can find such a meter still, I’d like to see it. They removed the temperature reading some time ago, because people were comparing what it said, against their local temperature, and getting a WTF1 response. But the whole site is like that. The source statistics are published at regular intervals ranging from daily to yearly. What this site appears to do, is to produce a hypothetical future figure that is based on a simple extrapolation of past trends. The counters, are precisely that. They count. The speed of the counter is set, based on the difference between the latest real figures and the hypothetical future figures. The speed is adjusted when new official figures are available. Consequently it is, at best, a calculated guess. The level of precision implied by the display is totally unwarranted. Thank you for confirming that Rereke. I’m wondering if that was a convenient explanation rather than an embarrassing “we removed it because the temperature stopped increasing”? I note that, according to them, there is about 40 years of oil left and 400 years of coal left. I reckon it was around half that a few years ago. The peak oil alarmists are way out of touch, that is unless they are deceivers like extreme Greens that aim to stop the modern world progressing further. P. T. Barnum said: “There is a sucker born every minute”. This carbon trading scheme is one of many off-shoots of the UN Environmental Programme, the brain child of scam artist and stock fraudster Maurice Strong, who is now in Beijing hiding from Canadian authorities. One of his close buddies, Al Gore, has been raking in the dough on this carbon trading nonsense. However, as usual, the smart money always gets out in time for others to hold the empty bag. Indeed, who would invest in a “commodity” like carbon that has absolutely no intrinsic value? Want to invest in a real commodity? Try food stuffs that people will always need to eat, or fuels that people will always need for heating. Strangely enough if you google. Of course – flirting with insolvency – is nothing new for a too big to fail bank. That report is just over a year old. They could be much further in debt by now. It’s just so stupid it’s infuriating, not because the scam and situation exists, it’s because of the MSM stonewalling most counter arguments over the years and the “don’t know about it” attitude of the population. Locally we have plenty of people with good “democratic” ideas that will get coverage only to have the crux of their argument omitted or watered down when presented in media. But it’s the “head in the sand” attitude of people that boils my blood, the same ones who scream the loudest when it goes pear shaped and expect someone else to bail them out, it’s too late and their inaction has enabled a change that’s hard to reverse. Perhaps the first rule for democracy. Yesterday I posted an off topic comment re: Southern Oscillation Index (SOI) with a prediction of wet summer/floods from on coming La Nina. “Murweh Mayor Denis Cook says a scheme to flood-proof some homes in Charleville, in Queensland’s south-west, has been a success. Over the past three years, the council has offered residents in at-risk areas subsidies to either raise their homes or relocate to higher ground. “People tell me this that they actually feel much safer now because they don’t worry now when you get a bit of heavy rain because … it has been done,” he said. Cheaper. Safer. You know it makes common sense. And not a carbon (sic) tax, or a Direct Action Plan, or RET in sight! The UN is a den of socialist movement extremists who have become drunk on perceived power and other people’s monies, they display no business acumen, no understanding of what makes markets work and I doubt that they could explain the difference between revenue and profit. The sooner their castle is dismantled and they are told to get jobs in the real world the better off the world will be. Even the UN original basis for existing has not kept up with the evolving world, the Convention for Refugees is now so out dated that people smugglers and people are exploiting the many loopholes opened, for example, by modern air travel that enables people to country shop and avoid breaking Convention rules. But I suspect that UN socialists are well aware of this and happy that there long term new world order agenda is helped by breaking down sovereign nation borders. As for bankers and climate change, they joined hands with the socialists only to create wealth, and now the bankers are in retreat as the scam is revealed. some of the “blue-chip” scientists & business leaders! I know I sometimes go on at length, but I’ll always attempt to tell the story correctly, so the full picture is seen. There’s a punch line at the end of this comment, and I hope you all see the significance of it. With respect to that CDM, that instrument was supposedly designed to see investments in renewables in the Developing World, paid for by all of us living in the guilt ridden already Developed World. So, out of the goodness of their hearts, those renewable suppliers will be going to Developing Countries to make sure those renewables are implemented. Let’s then look at just 2 examples, and I fully understand that the 2 economies are totally different. Let’s use a pool of money, and we’ll go the whole hog and use $2 Billion. In China, that $2 Billion will get you a new technology USC large scale coal fired power plant, right up to the power delivery stage, fully operational. $2 Billion. This Plant will have 2 units with generators of 1000MW, hence a total power of 2000MW. It will run at a Capacity Factor of 92%. It will deliver to Chinese grids an amount of 16,130GWH of power each year, and will last for 50 years. In Australia, that $2 Billion will get you a Wind Plant on King Island. It will have 200 huge towers with the turbines on top of them. It will have a total Nameplate Power of 500MW, and run at a Capacity Factor of 30%. It will deliver to Tasmanian and Victorian grids an amount of 1315GWH each year, 8.2% of the power from the Chinese plant, and may last for 25 years. The amount of power delivered in a year from this Wind Plant will be delivered by the Chinese plant every 29 days. This is a comparison of apples and oranges you say, so let’s then look at an equivalent between China and the Western World, In germany they have constructed a large scale new tech USC plant. It cost them, not the $2 Billion it costs in China, but $4.2 Billion more than double. A King Island equivalent wind plant in China will cost in the vicinity of $750 Million. So now, knowing how this CDM is supposed to deliver investment opportunities for renewable companies in that Developing World, then those renewable companies would have their top people in those Developing Countries checking out what can be done to ameliorate the effects of CO2 induced Climate Change. One of the senior men in the Vestas Company, suppliers of most of the World’s wind turbines is currently visiting the Developing World Australia, drumming up business here. You see, for every new renewable plant, the Government is chucking in up to half the total cost. Now, you tell me where those renewable companies will be sending their top people. In the Developing World, it’s funded by the CDM, (that endless bottomless pit of money, or as the main text from Joanne mentions, a quickly depleting pile of money) while here in Australia, those turbines are funded from the taxpayers endless bottomless pit of money. So, In China for the equivalent cost for that plant, Vestas, if they supply the turbines will get probably the lion’s share of that $750 Million. Here in Australia, Vestas will get a guaranteed $1 Billion from Federal and State Governments, and then the lions share of the rest of that $1 Billion further cost. You tell me where renewable companies will be sending their top people. It’s got nothing at all to do with saving the World from Climate Change. It’s got nothing at all to do with the altruism of the CDM. Base Load is not a damned adjective! Well here’s a bank that still wants to bang the drum on dangerous AGW. That’s the World Bank. Unbelievable BS. Obviously none of the 97% are investing any of their own money into it: only ours. Remember the Iraqi food-for-oil program, also administered by the UN. It was corrupt top to bottom, with UN officials deeply involved. Then UN-president Kofi Annan’s relatives got rich. Look for kick-backs to UN officials to understand why the CDM program continues. But since the 2011 survey carbon prices have plunged, with some kinds of units trading for a few cents a tonne, and they provide no material barrier to exit should the land be suitable for other uses. The report estimates that 86 per cent of the land deforested by large-scale owners would be converted to dairy farms and another 9 per cent to sheep and beef. “You see sunny skies but Obama sees doom. He says the weather’s a comin’ to get us right soon, & the only way to save the planet today, is with a big carbonated tax we can endlessly pay come on…. “Pay us your carbon taxes. Fill up our Goldman Sackses. Like I said previously. this isn’t science its politics. Science is being used as thin veneer to give the politics a semblance of gravitas. In truth there is no longer a warrant for us to fight on scientific terms since our adversaries have sh*t on every aspect of what that should imply. Too many scientavists, journalistas and lame duck bought and paid for politutes. There are no free markets anywhere simply because there are no free societies. Back in 2009, the US’s public TV news outlet the PBS NewsHour had an outsourced report about Deutsche Bank’s carbon footprint counter by the infamous Heidi Cullen, noting that her Climate Central organization was “a nonpartisan research group for journalists and scientists. Afraid not. 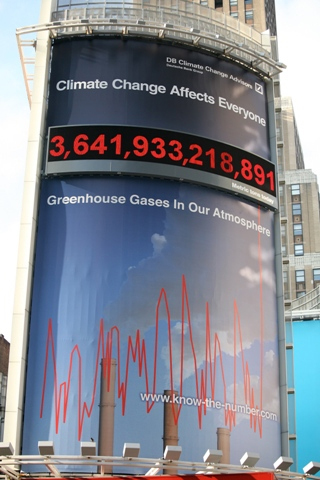 Climate Central was and is an advocacy group, reporting about an advocacy arm of Deutsche Bank. I reported about this general problem with the NewsHour and Climate Central last year, please see PBS NewsHour: Climate Central a research organization; Sorry, no. They advocate solving man-caused global warming… where I later caught an IPCC guy altering his bio page. Ha! That was my idea five years ago, I talked to my bosses about ‘not releasing HFC-22′ and trading it for carbon credits, but they did not understand about carbon credits and the CDM to know what I was talking about. Carbon was trading at about $30 back then. I don’t blame the Chinese manufacturers one bit for doing it, its easy money. They should borrow from the central banks over which they have control anyhow!